The British Overseas Territory of Tristan da Cunha in the middle of the South Atlantic is the world's remotest community. 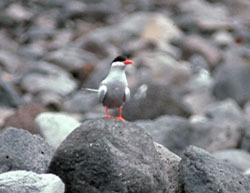 They are fairly small, grey and white terns with a full black cap, long outer tail steamers and striking red bill and legs in breeding plumage. Grey underparts contrast with a white cheek. 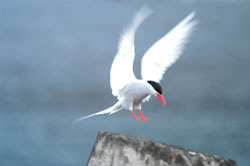 A few remain around the islands all year round, but most are present September - May. Breeding season is protracted as repeat clutches may be raised after earlier failures. 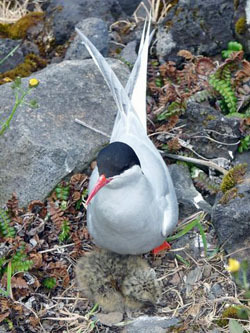 Eggs are laid November - February with chicks fledging mid January - April. 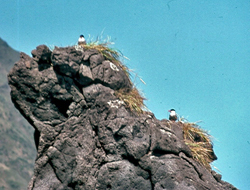 Nest sites are typically ledges on coastal cliffs and stacks, occasionally on boulder beaches. A King Bird with chick at the Potato Patches on 6th January 2010. A 2010 nest was photographed by Robin Repetto on a wall in the Potato Patches, raising optimism that recent systematic rodent baiting has been successful, and indicating an increase in numbers as pairs seek less protected sites. 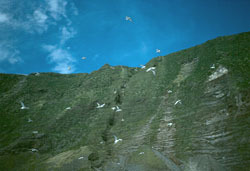 Endemic to the Tristan da Cunha Islands and winters off South African south coast. 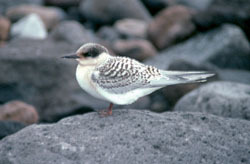 Other subspecies breed on Antarctic Peninsula and sub-Antarctic islands, dispersing north in winter. Recent estimates suggest : 50 pairs on Tristan; 200 on Nightingale; 100 on Inaccessible and 500 at Gough. 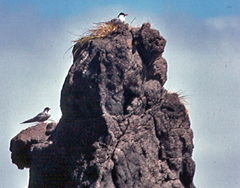 Conservation status is not threatened, though the species was far more common on Tristan, probably being displaced by rats and cats.